The excavation of an Egyptian sphinx made worldwide headlines last October when it was unearthed on the Central Coast. 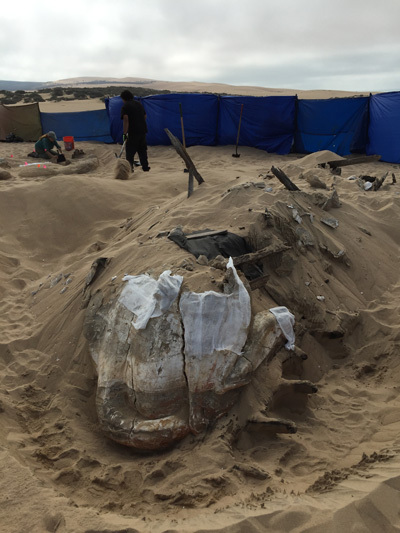 Buried beneath the sands of the Guadalupe-Nipomo Dunes, located 35 minutes from San Luis Obispo, the sphinx is part of an on-site film set of a bygone era. Egyptian fever raged across the world throughout the early 1920s after the unexpected discovery of King Tutankhamun’s tomb in 1922. Cecil B. DeMille captured this cultural obsession in his 1923 silent film “The Ten Commandments.” Shot on the Central Coast, he made the set lush and expensive to match people’s excitement with the archeological find. Thirty years ago Peter Brosnan, a Los Angeles filmmaker, identified an excerpt in the director’s autobiography that playfully suggested he had left the set at the dunes. After Brosnan’s discovery, he orchestrated the Lost City Project to help preserve the set pieces. By 1990, it was confirmed that a few pieces of the set were still intact. Soon after, funding for the excavations ran out, and efforts to recover the film’s artifacts weren’t renewed until 2010. 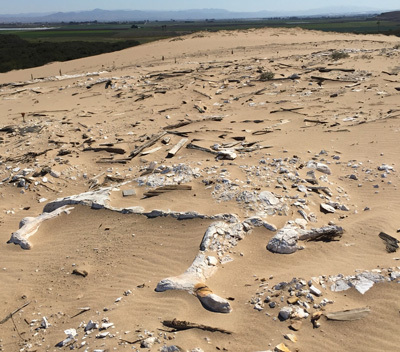 Guadalupe-Nipomo Dunes Complex Executive Director Doug Jenzen (M.A., History, 2011) recognized the significance of the site’s history, and since 2012 has been working to continue recovering artifacts in an effort to revitalize the project. “In 2012, we raised enough money to do a full archeological survey of the site and excavate a sphinx face and front paw,” Jenzen said. But money ran out again, and it wasn’t until October 2014 that archeologists were able to return to the site. Funding was critical due to difficult preservation efforts, as the artifacts were originally constructed out of plaster of Paris, intended to last only two months. The second time on the site in recent years, the team was able to unearth a 10-foot portion of a sphinx body. 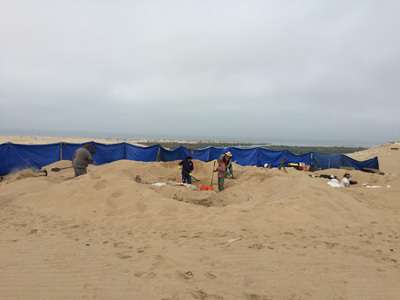 Cal Poly history major Courtney Allen, Dunes excavation intern, joined the expedition team this second time around. “There was a lot of thinking and experimentation about how to best get the pieces out of the sand, keep them in good condition, and then support them because they were hollow on the inside,” Allen said. Jenzen, in turn, sees the reconstruction of the set pieces as working to reveal a previously lost piece of film and cultural history — one that tells a unique story of the Central Coast. For now, excavations have come to a halt, but Jenzen hopes to revisit the dunes to recover the remaining pieces of the sphinx body. But the public can content itself with the center’s current holdings, which include a nearly-intact sphinx, select set pieces from previous excavations, and a short film showing the site and the dig. More artifacts will join the exhibit as they are catalogued and preserved. For more information, visit the Dunes Center website.